Stack economizers are specially fitted to install onto a boiler's stack, as close as possible to the flue exhaust. They capture otherwise-wasted heat and, by means of a water to air heat exchanger, utilize it pre-heat water before it enters the boiler for full heating. A non-condensing boiler with a stack economizer on top essentially functions much like a condensing boiler. Thus, you get higher thermal efficiency (often raised from 80% to 90%), but at a much lower cost than replacing your existing boiler. As energy expenses continue to rise and stack economizers continue to improve in compactness, durability, and efficiency, they are an ever more attractive option. For a boiler to safely and cost-effectively take a stack economizer, it must have a forced draft burner and should have an HP of at least 60. The economizer itself needs to be made of high-quality materials, like stainless steel, that will not rust, and its inner surface must be easily accessible to facilitate maintenance. Super R﻿adiator Coil﻿s is a trusted name in the commercial HVAC industry, and it has earned this trust by by manufacturing top-quality equipment, including stack economizers, for decades. Super Radiator Coils also has a long history of working closely with each client to ensure they get the exact product that best fits their needs. 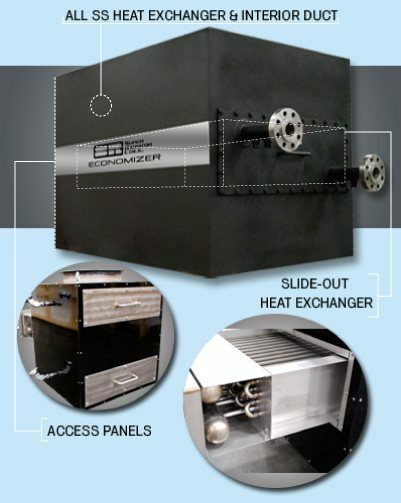 Their engineers even meet directly with customers, and their personnel have the necessary training and experience to custom-design a stack economizer that will work on any qualified boiler and across a wide range of applications. ATI is committed to always facilitating the purchase of the highest quality equipment for its customers. We work with Super Radiator Coils to help provide you with a higher-efficiency boiler, which will reduce waste and lower energy expenses. We can guide you through the process of deciding on which stack economizer will work best with your commercial steam/water boiler or arrange for a customized design.